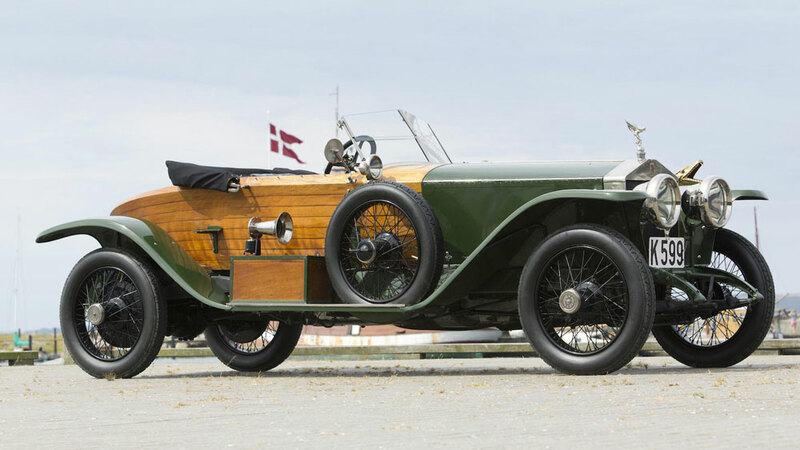 Bonhams will sell 48 cars, including 13 Rolls Royces, from the Frederiksen Collection at a classic car auction in Denmark on September 26, 2015. The single-owner collection includes the best of British, European and American motoring with most cars from the pre-War period and several manufactured before the First World War. The sale will feature some 13 Rolls-Royce, three Mercedes-Benz, three Cadillac’s, two Maybachs and two Bentleys, in addition to offerings from Lagonda, Duesenberg, Jaguar, Horch, Chrysler, Renault, Citroën, Isotta Fraschini, Ahrens-Fox, Lincoln, Stutz, Packard, Auburn, Pierce Arrow and Alvis. The Bonhams Frederiksen Auction will arguably be the most exiting classic car auction ever held in Denmark and Scandinavia. It will feature 48 top classic cars from the private collection of Henrik Frederiksen. The Frederiksen Collection sale will take place at Lyngsbækgaard Manor, in Mols Bjerge national park, Denmark, on Saturday 26 September 2015. The auction will be conducted in Danish crowns (DKK). A 1933 Maybach DS-8 Zeppelin Cabriolet has the highest pre-auction estimate for the Frederiksen Auction of $3.1 – $3.7 million. This magnificent cabriolet was one of the most luxurious cars of the interwar period. It featured an 8-liter, V-12 Zeppelin Maybach engine and an advance 8-speed manual transmission. The car comes with quite a history. It was originally fitted with a seven-passenger state limousine body and given to His Highness, The Maharajah of Patiala and Raj Pramukh, by Adolf Hitler in the hope that the maharajah would favor Germany, or at least stay neutral, in conflict with Britain. The bribe was gladly accepted but kept hidden and only revealed after the Second World War. The Maybach was first registered only in 1951 and was one of the most-important cars in India during the 1950s. The original bodywork was removed around a decade ago – it is now in the Museum of Historical Maybach Vehicles in Neumarkt, Germany – and replaced by a cabriolet body to original Spohn designs but never actually built during the 1930s. The 1937 Maybach SW-38 “Special Roadster” (estimate $1.3 – $1.5 million) is a smaller Maybach and was the last model released by the company before the outbreak of the Second World War. The car originally had a Pullman limousine coachwork but was replaced by a Special Roadster bodywork based on original Spohn drawings for a similar model. The car is in a superb restored condition. The most valuable American car in the Frederiksen Collection is a 1930 Duesenberg Model J Disappearing Top Roadster with coachwork by Murphy – estimate $2.6 to $3.2 million. The car originally belonged to film producer, photo essayist and cinematographer Shirley Carter Burden – a great grandson of Commodore Cornelius Vanderbilt. The car has matching numbers and original coachwork with ACD Category 1 certification and is considered one of the most original examples of the disappearing top Murphy roadsters. A well-known and historically important 1914 Mercedes Benz 28/95 Phaeton is expected to achieve $1.5 to $2 million. The car was originally ordered in 1914 for delivery to Paris but the outbreak of the First World War put paid to that order. A second order in 1917 from Berlin was also cancelled and the car was finally registered for the first time in 1920 in New York. In 2003, it won the FIVA award for most original car at the Pebble Beach Concours d’Elegance. A second Mercedes Benz car is expected to sell for over a million dollars – the 1935 Mercedes Benz 500K “Special Roadster” has a pre-auction estimate of $990,000 to $1.4 million. The car was originally delivered with Cabriolet C coachwork – original Spezials would achieve significantly higher results than the re-bodied cars. A 1958 Bentley S1 Drophead Coupe with coachwork by H.J. Mulliner is one of only a handful of post-War cars on offer at the Frederiksen auction. It was first built for John D Rockefeller Jr and comes with an estimate of $1.1 – $1.4 million. Just 12 of these cars were built and the car on offer is a matching numbers example in well-restored condition. The 1927 Bentley 6 ½ Litre “Bob Tail” (estimate $700,000 to $920,000) on offer is a rare car – only 20 were completed on the short wheelbase chassis.